First and foremost, this is a bible study, albeit a creative one! Each week, we will read through the bible study lesson that I've prepared. You are encouraged to take notes, as these thoughts will help you when you sit down to write in your journal. This takes approximately 20 minutes. 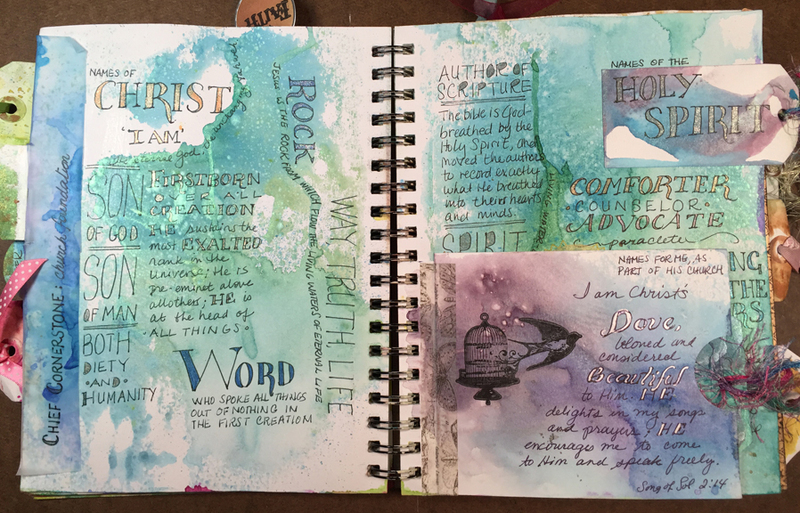 Then over to the art tables we go to create our FaithArt journal a few pages each week. Our materials include spray inks, stencils, rubber stamps, tags and washi tape, and most importantly, your own handwriting. No art background is required! FaithArt is intentionally designed to be accessible to all. Each week I demonstrate another technique step-by-step, and you will follow along. Your inked pages lay the beautiful foundation for what is to come. Over time your pages become layered with all the things you explore both spiritually and creatively. Allow approximately 2 hours per lesson. Each week, you are given prompts for the writing portion of your journal. Using these prompts alongside the lesson and your notes, you will write onto your inked journal pages. This is your "homework"; your private time to reflect on the bible study and express yourself. This is the most important part of FaithArt! Your journal becomes personal, rich in meaning, and more beautiful as you begin to show your heart. Each person's journal is unique to them. The amount of time this takes is different for everyone. Start by allowing yourself 20 minutes of writing time each day and see how it goes.